Canon 800mm f/5.6L IS lens and the EOS-1D MIII. ISO 1600. Evaluative metering +2/3 stop: 1/250 sec. at f/5.6. At times, we had bears–including this one–as close as 6 feet from us, and at times, the 800 was simply too much lens, even for head portraits. This young sow was hiding behind us in an effort to avoid the amorous advances of an old boar. Her seemingly sly style and the exceedingly sharp eye make this one of my favorite bear images from the trip. Note also the superb quality of Mark III ISO 1600 images. The Bear Boat Instructional Photo-Cruise was a wonderful success. We had quite the travel adventure this spring; check the blog at www.birdsasart-blog.com and scroll down to the June 11th, entry, “Planes, Boats, and SUVs.” In addition, on our travel catch-up day, June 3, we enjoyed some fine photography right in Anchorage. Once we (finally!!!) made it to the boat, we spent our first afternoon/evening (June 4th) as planned, photographing sea otters and a huge Black-legged Kittiwake colony at Whale Pass, near Kodiak, AK. We continued with the otters the next morning, this time with much more light than the previous afternoon. As it was a clear day we quit fairly early and made the six-hour trip across the Shelikof Strait in search of Coastal Brown Bears (that are actually huge grizzlies). We anchored up in Kukak Bay in Katmai National Park that afternoon and soon after dinner we were photographing the bears at close range as expected. Ah, dinner. The boat had a fantastic new cook, Sherri (“I have a need to feed”) who stuffed us with great food at each and every meal. Off the top of my head I can come up with prime ribs, fresh tanner crab (that we caught a la Deadliest Catch—well, not exactly), huge and amazingly tasty barbecued Pork Ribs, killer steaks done to individual perfection (that would be rare for me), and baked chicken each prepared as if by a world class chef trained in fine dining. There were so many crabs in the pot that even though we threw a bunch back Sherri used the left-over crab meat for most every breakfast and lunch. As a diabetic I stayed away from the rich desserts, except for the night near the end where I had three pieces of Sherri’s carrot cake plus a left-over slice of fresh berry pie; both were other worldly. I did not take my blood sugar that next morning…. Our last five days were a blur of bears and eagles and eagles and bears. The first few days we rose on the late side as the bears wake up late, but after several clear sunrises we were up early the last two days and in the skiff before the sun rose. Our best bear photography was in the evenings; most nights we did not head for the sedge meadow until after dinner. We had nice light until after 10pm. Aside from the bears and eagles, we photographed kittiwakes and Glaucous-winged Gulls in flight, Harbor Seals on the rocks, Wilson’s Warbler, Savannah Sparrow, and kelp patterns. In addition of course, we had some beautiful landscapes to photograph and on the morning of the 9th, a lovely full moon setting over the snow-covered mountains. The group got along great and with the clear conditions we had lots of midday time for Photoshop lessons. On day five, Linda shared her hummingbird images with the group; everyone was totally amazed. Jim Heupel has long been an accomplished photographer; his patience got him the eagle-landing-with-fish image that we had all dreamed about. It has been great to watch Monte Brown develop into a fine photographer; he created many wonderful images on this trip including more than a few that I was quite envious of. George is also a fine photographer and was (and is) anxious to hone his skills both in the field and at the computer. He had lots of questions, and he too had lots of great trip images. My very favorite thing about George was the fact that he spent lots of time complaining about Nikon autofocus and MAC computers. Man, you gotta love that! (At least if you are me ) George will be joining me for the September trip; we still have room for a few more folks who would like to get close to bears catching and eating salmon. For the technical details, and to learn exactly how I created the image above from the image below, visit the blog at www.birdsasart-blog.com. Better yet, you will learn what I was thinking when I pressed the shutter button. Regular readers and Digital Basics purchasers know that I tried using Adobe Camera Raw to convert my Canon RAW files for about a year before giving up some time ago due to problems with the accuracy of the colors. About 8 months ago I began experimenting again with ACR, especially with images that featured saturated REDs and/or YELLOWs. When using BreezeBrowser to convert my RAW files (BrBr uses the Canon software development kit), I found that I had to dramatically darken many images in order to prevent burning the RED or YELLOW channels. It was impossible to create pleasing images from the too-dark converted TIFFs, so I returned to ACR to take advantage of the Recovery Slider. This restores highlight detail while not affecting the overall exposure. The more I used it the more I liked it. And as I concentrate so on exposing to the right I often have images with some overexposed highlights. I would say that right now I am using ACR for more than 95% of my conversions. Go figure. I do need to say that BreezeBrowser is still the heart and soul of the editing portion of my digital workflow. It is still the fastest way to edit large numbers of images. And it is relatively inexpensive. In addition, BreezeBrowser is the storehouse and filing cabinet for our entire digital image collection. There will be a line of text bottom center. Mine reads “Adobe RGB (1998); 16 bit; 2592 by 3888 (10.1MP); 300 ppi. Adobe RGB is my preferred color space. 16 bit is to be preferred to 8 bit for its greater range of colors. 2592 by 3888 (10.1MP) indicates the native resolution of the camera you are using, in this case, the E)S-1D MIII. 300 ppi is my personal preference. You can set your preferences here by clicking on the text line and then selecting from the various drop-down menus (and by typing 300 ppi into the appropriate box if need be). Make sure that the highlight and shadow warning boxes are activated. You will find them in the upper left (shadow) and right (highlight) corners of the histogram box. A thin white box around each signifies that it is active. If there are underexposed areas of dark pixels, indicated by the dark blue shadow warnings, move the Blacks slider to the left until they disappear (plus a teench more). Once you are finished, or if there are no highlight or shadow warnings present to begin with, adjust the Exposure slider. I like to have the histogram end a fraction of an inch from the highlight axis, the one on the right. Next, adjust the Black slider as needed. Here I prefer to have the histogram end a fraction of an inch from the shadow axis, the one on the left. Note: I rarely use the Fill Light slider preferring instead to use a Shadow-Highlight adjustment in Photoshop. Do note that if you have room to the left of the histogram, using either the Fill Light Slider or Shadow-Highlight should (theoretically) be unnecessary. The Brightness slider is next. Move it left or right to taste. This slider is the equivalent of the Middle Tone slider in Levels in Photoshop. I almost always move the Clarity slider to +30. This applies a small amount of “in-camera” sharpening. I have never had an image look oversharpened while using this setting. Hit Open Image. The RAW file will be converted to a 16-bit TIFF and opened in Photoshop. If you are at a loss as to what to do next, get yourself a copy our Digital Basics PDF. The information above and the Refine Edges Tutorial in the BAA Bulletin 290 will be added to the next update of Digital Basics. Not sure when other than to say, “not soon.” If you are fairly experienced in Photoshop but like my easy-to-read, easy-to-follow writing style (as above), you can learn a ton about our digital workflow along with dozens of great Photoshop tips in Digital Basics. 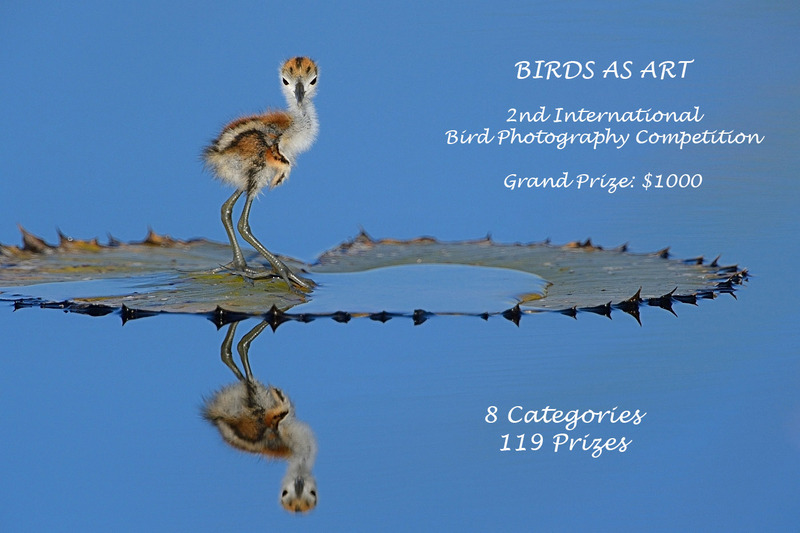 And “The Art of Bird Photography II” (916 pages on CD only), written in the same style, covers in detail everything that I learned about nature photography between 1998 and late-2006: https://store.birdsasart.com/shop/item.aspx?itemid=19 or on sale with the original ABP here: https://store.birdsasart.com/shop/item.aspx?itemid=84. Canon 800mm f/5.6L IS lens with the 1.4X II TC and the EOS-1D MIII. ISO 500: 1/400 sec. at f/8 set manually after histogram evaluation. This bird responded to an audio recording of its call. Unbeknownst to many nature photographers, many top bird photographers (not including yours truly) have been using recording of bird calls for years to attract their subjects—especially songbirds—into photographic range. It has always mystified me as to why those who engage in the practice often act as if it were something that they were ashamed of. It seems to be bird photography’s darkest, dirtiest secret. If done properly—I have only recently begun using calls—it can be done effectively (where it is legal) without stressing the birds. Many biologists use bird song recordings on the nesting grounds to perform breeding bird censuses. Daniel Cadieux, one of our crack BPN (http://www.BirdPhotographers.Net) Avian Forum Moderators, wrote a great tutorial on the practice. You can find it here. To my knowledge, BPN is the first educational or other web site to offer both a detailed tutorial and an honest look at the use of audio in bird photography. Daniel will be expanding his post into a full length article for the BPN e-Zine. Canon 100-400L IS lens @310mm and the EOS-40D, ISO 800. Evaluative metering -1/3 stop: 1/125 sec. at f/6.3. With the combination of audio and a blind I was able to create frame-filling images of subjects that are normally very difficult to approach. This warbler came down to eye level and was only about 8 feet away. Thanks a ton Dan for sharing this great image with us. As noted above, do check out Dan’s BPN thread on using audio for your bird photography here: http://birdphotographers.net/forums/showthread.php?t=37765. Dan has created hundreds of great images with what many would consider only meager gear…. Canon 800mm f/5.6L IS lens with the 1.4X II TC and the EOS-1D MIII. ISO 800. Evaluative metering +2/3 stop: 1/000 sec. at f/8. We were up and at the otters early on Day 2 to take advantage of the sweet morning light. Even with everyone staying as still as possible, framing a bobbing otter from a 24 foot skiff in relatively open water is a huge challenge. I stayed at ISO 800 for additional shutter speed. The 800’s new four-stop IS system did not hurt either. This otter was the star of the morning; it stayed in the same spot for several minutes while the shutters fired almost non-stop. Canon 800mm f/5.6L IS lens and the EOS-1D MIII. ISO 400: 1/1250 sec. at f/8 set manually after histogram evaluation. Wind from the side? A good situation. You can make images like the one above. Working in manual mode is mandatory when the bird might be flying against a light sky one moment, and wooded mountains the next. Canon 800mm f/5.6L IS lens and the EOS-1D MIII. ISO 400: 1/2000 sec. at f/7.1 set manually after histogram evaluation. Wind and sun behind you? An excellent situation for obvious reasons. Canon 800mm f/5.6L IS lens and the EOS-1D MIII. ISO 400: 1/1600 sec. at f/7.1 set manually after histogram evaluation. Sun behind you and wind in your face? A challenging situation. Thinking a bit out of the box can help. This image has potential value as stock photography as it illustrates several concepts…. I have not so far upgraded to CS-4, and doubt that I will any time soon. (Do note that I have made many wrong decisions in the past…). Whenever I have seen folks working with CS-4, I have seen folks having problems. On the bear boat, I attempted to work with CS-4 on two different computers. I understand that instead of having to create an adjusment layer for everything that you want to do, that you can simply click on the appropriate symbol in the new pallette to access the layer you want. That worked fine for me for the first layer, which for me is usually Levels. So I clicked on the symbol for Layers and the Layers dialogue box popped up. The problem was/is that the Layers dialogue box covered the pallete; when I wanted to open a new adjustment layer, Curves for example, I had to click on another symbol to access the vaunted pallete…. It is likely that you can change your preferences so that the active layer does not cover the pallete, but why should that be necessary? t makes no sense to me. Here is another instance of CS-4 frustration: I created a new curve that I wanted to save, but try as I might, neither I nor anyone else could figure out how to save it. In CS-3, saving a curve was practically a no-brainer. Why change something for the sake of changing it when it only results in confusion and wasted time? My understanding is that the biggest new trick in CS-4 is the ability to make localized adjustments to your RAW files with either the Adjustment Brush or the Graduated Filter. Admittedly, this is a huge plus, but so far I have not run into anyone using CS-4 who knows how to use either of the two new tools. You gotta love it! As it is hard to teach an old dog new tricks, I am sticking with CS-3 at least for a while longer. I any case, I was quite impressed by the book, which is actually a third edition, written by Ellen Anon and son Josh Anon. The title is a bit inaccurate, as about 80% of the text can be applied to most recent versions of Photoshop (especially to CS-3; I of course consider that a plus), and in addition, includes excellent coverage of for Photoshop Elements users. (The latter info is neatly set off in light purple text boxes.) The book is well written, the directions are easy to follow, and the numerous Photoshop screen captures ensure the reader a clear understanding of each concept. With coverage ranging from basic Photoshop concepts to fairly advanced techniques, the book has something for everyone (even me!) My emergency room reading inspired the Refine Edge Tutorial in BAA Bulletin 290: http://www.birdsasart.com/bn290.htm. And there is lots more in the book that I need to revisit while working on images. I learn best by doing as I study, and then rewriting the instructions to myself in an e-mail. And best of all you will find detailed instructions on how to use CS-4’s most powerful new tool, the Adjustment Brush, on pages 114-116. If you own CS-4 and have been confused by it at times, you will want a copy of this book. And if you are still using CS-3 as I am, and you have mastered everything in Digital Basics and in APTATS, then you too will want a copy of “CS-4 for Nature Photographers.” The book is available from BIRDS AS ART for $37.99 plus $5 shipping and handling (to US addresses). Your purchases of books and photographic accessories from BIRDS AS ART help support the creation of the Bulletin that you are reading now and the BAA Blog. And they are of course greatly appreciated. The initial limited sale period for the classic Arthur Morris/BIRDS AS ART image, “Fire in the Mist,” will end in just two weeks on June 30, 2009. We will offer our second print in the series soon thereafter. The first batch of 19 prints has been shipped. The last batch (for now) will ship no later than July 15, 2009. If you missed the grand opening of the BIRDS AS ART On-Line Store, be sure to check it out here: https://store.birdsasart.com/shop/default.aspx. The store was created by Blake Shadle and was stocked and tested by Jim Litzenberg and Jennifer Morris. The store was designed to make your on-line shopping efficient and completely hassle-free. If you need additional product information or advice or help with your on-line purchases, do of course call us at 863-692-0906 during regular business hours. If you experience any problems while using the store, please let us know via e-mail: birdsasart@att.net Note: Jim, my right-hand man, is taking a rare vacation so I will be spending lots of time answering the phone this week. This three frame stitched pano was created with the Canon 24-105mm IS L lens (handheld at 47mm) and the EOS-1D MIII. ISO 800. Evaluative metering +1 2/3 stops: 1/50 sec. at f/5 in manual mode. Getting up early has it rewards…. I ran a Linear Burn on the sky that deepened the blue along the horizon and I Patch Tooled out a floating sea otter that was tiny in the frame and thus distracting. You can learn both of these techniques plus tons more including the basics of creating stitched panoramic images using CS3’s Photomerge feature (page 88, bottom) in the latest update of our Digital Basics PDF File. Sept 4-10, 2009$6999. Openings: 3. (It is advised that you be in Anchorage on the afternoon of the September 2nd to be assured of not missing the boat!). This one is the bears-catching-salmon trip. In addition, Glaucous-winged and Mew Gulls eating roe are a certainty. Dark phase Northern Fulmars and Black-legged Kittiwakes (including the gorgeous immatures), Harbor Seals, and Stellar’s Sea Lions are likely. Did I mention bears catching salmon? And more bears catching salmon? The image was created in camera with the Canon 400mm IS DO lens handheld with the EOS-50D. ISO 200. Evaluative metering +1/3 stop: 1/15 sec. at f/7.1 in Tv mode. I absolutely hated the out-of-focus object in the u-r-c but had to look at the image and think for a few days before coming up with a plan… I use a combination of the Patch Tool, the Clone Stamp, and a few Quick Masks to create the image below from the image above. I was proud of my efforts. As always, all of the above is covered in detail in Digital Basics. You gotta love it! Can you find the second bird that I eliminated from the original capture? Slide program on the evening of FEB 9. Slide program on the evening of FEB 11. 6-FULL DAYS: $2799. (Non-refundable deposit: $500.) Limit: 10/Openings: 5. Co-leaders: Tim Grey, and Alfred and Fabiola Forns. Escape winter’s icy grip and join me in Florida in the land of ridiculously tame birds. This IPT will visit Little Estero Lagoon which has been fantastic for the past three years (and been getting better each year), the Venice Rookery, several killer Burrowing Owl nests on Cape Coral, and several spots on Sanibel including Blind Pass, the Sanibel Fishing Pier, and the East Gulf beaches (for Snowy Plover). If we have a foggy drizzly morning we may visit Corkscrew Swamp and Sanctuary. We have arranged for morning low tides at Little Estero and a setting full moon for our Saturday visit to the Venice Rookery For the first time ever, we will not be visiting Ding Darling NWR as photographic opportunities there have been diminishing steadily for the past decade. As you can see, I am teaching less and less, taking fewer folks, and lengthening the IPTs to allow for a slightly more relaxed pace with repeat visits to the best locations.